It’s not fair: celebrities seem to have a brand new ‘do every time they make public appearances, and they always seem to look flawless no matter how they wear their hair. In fact, it almost seems too good to be true. What’s their secret? Pretty much every celebrity has at one point, if not regularly, worn hair extensions to enhance her natural locks. I know what you’re thinking: “Hair extensions? Those fake, doll-hair weaves I saw everywhere ten years ago?” Not exactly. Earlier versions of hair extensions had a reputation for looking phony, being uncomfortable and just overall being poor quality. However, the industry has advanced tremendously since the first hair extensions came onto the market, and today’s methods and materials are about as close to the real thing as you can get. (For some equally helpful tips on what not to do, see this list of celebrities who didn’t get it right the first time). are much easier to apply. 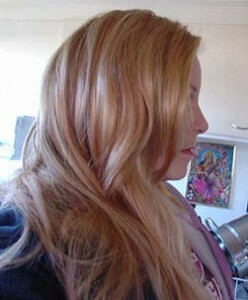 Not to mention, clip-ins are non-committal, so you can easily remove them when you don’t feel especially glamorous. With clip-ins, you simply add a little volume, style it with your ‘do, and you’re ready to hit the town. Even if you choose affordable clip-in styles, you’ll want to take good care of your hair extensions to maintain the quality and lifespan of your gorgeous new locks. Simply wash your hair extensions with a mild shampoo and cold water, making sure to rinse thoroughly. Apply a leave-in conditioner and use a wide-toothed comb to work through any tangles. Let your hair extensions air-dry overnight by hanging them on a pants hanger. If you must blow-dry your extensions, make sure to keep the dryer on cool, low heat. Hair extensions can be a dramatic solution for changing your entire look, but that doesn’t mean they have to come with a dramatic price tag. If you want celebrity-style hair that wows at your next big party or even just a fun evening out, clip-in extensions are a quick, easy and cost-effective way to give you the body and volume you’ve always wanted. Make sure to keep the tips above in mind to find the perfect fit for you.